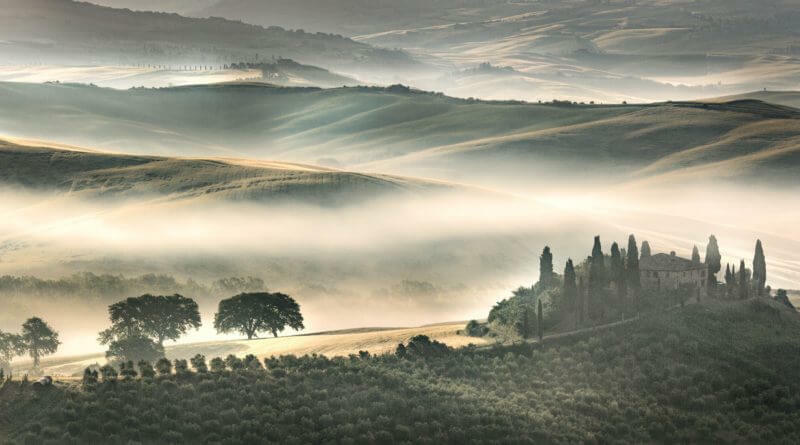 A mist-strewn Tuscany scene at dawn, by Milford-based photographer Ashley Franklin was awarded second place in the Society of Photographers’ Landscape Photographer of the Year Award 2018. This prestigious award is the culmination of a year-long striving. Members are invited to enter a single image in the Society’s monthly competition, with the Gold Award winners considered for nomination for the Photographer of the Year prize. This is the fourth landscape award at the Societies of Photographers for Ashley; he has been a runner-up on two other occasions and won first prize in 2011. Significantly, all of Ashley’s awarded images were taken in the same region and it inspired him to set up Under Tuscan Skies, a workshop for photographers in the D’Orcia Valley. Ashley’s first workshop last May – alongside Burton-based landscape photographer Wayne Brittle – was a great success. Following that workshop, Ashley arranged for the photographers to exhibit their work at Angelo’s, the Milford restaurant where Ashley displays his Tuscany pictures. Ashley and Wayne already have four photographers booked for their 2019 workshop in May. “Being able to show my award-winning landscapes on my website has undoubtedly boosted interest” said Ashley.